Ever since the introduction of the area meet, the qualification process for the UIL state track and field meet has become even more challenging than before. Coaches, athletes, and teams have to be sharp and on point for four consecutive do or die competitions. There is no other track and field qualifying standard like it on earth. UIL athletes that qualify for state and even more so for those that win can claim that they are truly tested at the end of the season. Realignment makes some area meets even more challenging when they paired up perennial strong teams in the same districts and neighboring districts. Here are some area meet events that will eliminate some state worthy competitors at the area meet due to how strong the events will be. This meet will have some of the best distance runners in both the Houston area and in the state competing in the two distance events. The four advancing spots in will be tough to earn. In the 1600m, Ryan Schoppe (La Porte)and Jose Gonzalez (Galena Park North Shore) from District 21-6A, come in with district times of 4:12.4 and 4:26.4. They will match up with District 22-6A qualifiers Carter Storm and Nick Majerus (Kingwood) who ran 4:24. and 4:24.43 at their district meet. Those four runners are all accustomed to making it to the regional and even the state meet as three of the four have qualified for state in the 1600m over the last two years. However, there will be more company and quality in the area race. Nick Cisneros (Pasadena Rayburn) is having a great 2019 and will look to continue his season. He ran 4:28.98 at district to move on. With only four spots available, he will have to have the race of his life just to get the chance to do it again at regionals. This season has been one full of PRs in just about every event for Cisneros and he'll need that to continue. Schoppe has the top two times in the state this year, Gonzalez is ranked #12 in Texas (4:17.10), Storm is #13 (4:17.16) and Majerus is #35 with a 4:20.80 SB this year. The boys 4x400 relay in this area meet is top heavy. 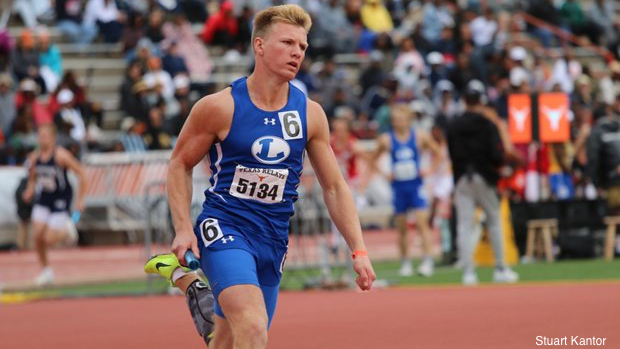 It has the top two ranked relays in the state with Liberty Hill (3:19.53) and Lampasas (3:19.61). Frequently, Lampasas is one one of the top teams in the region. This season, they have run like studs all season long. Liberty Hill proved that they were to be shaken. They took a swing at the top spot and got a big hit with the exciting race that was. Lampasas could be looking for redemption next week. The way these two teams ran at the 27-4A district meet last week, they should easily qualify for the regional meet. However, it's the 3-6 teams that will find murky water as they try to advance. Only a few seconds separate the four team. With the ability of Liberty Hill and Lampasas, there is very little room for even the slightest mistake. Four of the top 10 4A teams and two other close ones will make the area race one to remember. They'll earn a chance to do it again at the regional met when they'll take on Stafford and others, but the test will be how tough and close to perfect Canyon Lake, Fredericksburg, Llano, and Burnet can race just to get the chance. El Paso is straight fire in the 800m. The 1-6A boys 800m was a barn burner as seven dudes ran 2:00 and under and five boys were at 1:56 and under. The Coronado boys led the way with Liam Walsh (1:54.97) looking to get back to the state meet and his teammate Alan Alba (1:55.60) looking to go with him. They qualified with Matthew Lindsey of Montwood (1:55.66), and Jacob Ye of Americas (1:55.97). With four buys running 1:55 to able to advance to area, you'd think that they were in the clear with an easy ticket to the regional meet. If you thought that, well think again. They are going to meet up with quality competitors from district 2-6A. Amarillo Tascosa senior Erik Zamora only ran 1:59.14 at his district meet, but thats all it took for him to qualify. He has a 1:55.27 PR from earlier this season and he has the wheels to mix it up with the district 1 guys. With five 1:55 guys and trying to get one of the only four available advancing spots and three of the guys being seniors, look for this race to be an exciting drag out fight to the finish type of race. The areas of Texas making up these two districts have some of the best distance runners nationally for both girls and boys. The UIL 6A teams in the area meet will show how tough it is to grab qualifying spots. Last week, it took minimum times of 4:27.18 and 9:30.54 to survive and advance to the area meet from the boys 5-6A district as Nate Lannen (4:23.86/9:22.25), Dominick Vastlik (4:26.13/9:27:18), Braden Lange (4:21.86/9:30.39), Logan Mitchell (9:30.54), and Antonio Florcruz (4:27.18) all ran close races to literally survive. Tomorrow, we'll see district 6-6A athletes from Coppel, Flower Mound, Hebron, Irving MacArthur, and Marcus battle it out for qualifying spots. They have some top guys in the state who will fight for the four spots and join the 5-6A boys for next week's area fight. Flower Mound's Alex Maier (4:16.77/9:11.21) and Jarrett Kirk (4:17.04/9:07.56) are both cross country state champions and come in with stud times in both events. Another Flower Mound runner with times just as fast as the winning time from district 5-6A results is Thomas Romanow (4:20.86/9:17.32) and he will be in the mix to qualify out of the 6-6A district to get a chance to battle it out at the area meet. There is also a stud duo from Hebron. Seniors Myles Richter (4:19.89/9:12.93) and Jayce Turner (4:20.25/9:11.64) are in the same boat as the FM group. They have SB times that will put them in position to grab qualifying spots at both tomorrow's district and next week's area meet. Check out 2019's top 10 from the 6-6A district and see who all could be in the mix both tomorrow an possibly next week.